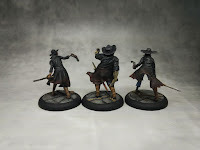 Busy, busy time again but I managed to paint these three up. What better way to humiliate you enemy than to send their own troops after them? After some modifications these guys are perfect fit for the job. Guild Autopsies are on the cheap side and offer some decent range threat to a faction that doesn't excel at it. With some luck, they can also summon Mindless Zombies as a (0) action. 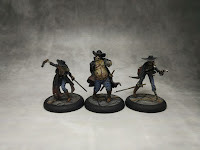 I painted them using similar colors to those used on my Guild Marshals to keep some kind of coherence among them. 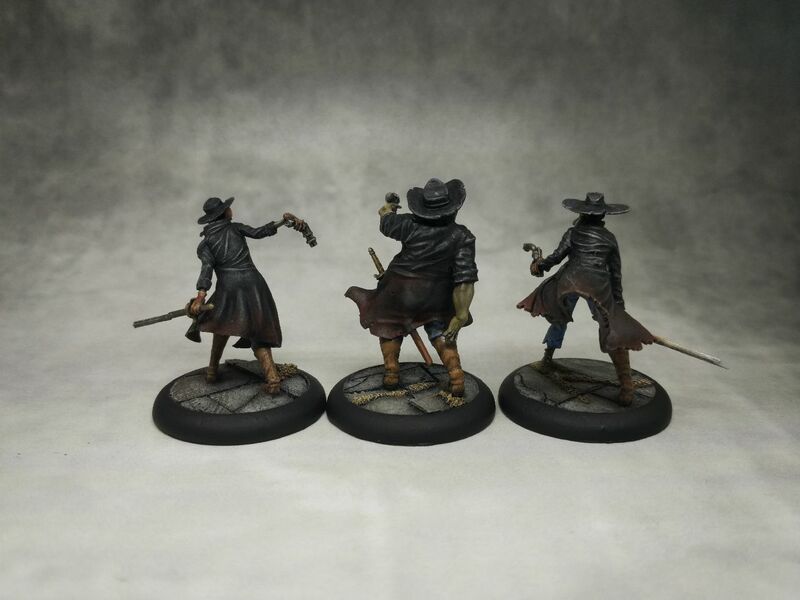 The models are really well designed with great poses but putting them together wasn't easy, especially their coats. Znowu wpadłem w wir pracy, ale mimo to udało mi się maznąć tą trójkę. Czy może być coś bardziej upokarzającego dla przeciwnika niż wysłanie przeciw niemu jego własnych żołnierzy? Po pewnych zmianach ci panowie świetnie nadają się do tego zadania. Te chodzące sekcje zwłok są tanim minionem i dają Ressurekcjonistom strzelanie, coś co nie jest główną siłą tej frakcji. Przy odrobinie szczęścia mogą też przywołać za (0) Mindless Zombie. Po malowałem ich używając podobnej palety do moich gildiowych Marshali, żeby utrzymać odrobinę spójności pomiędzy modelami. Figurki są bardzo fajnie zaprojektowane, pozy dynamiczne, tylko sklejanie ich to wyzwanie, zwłaszcza ich płaszczy. While painting these, I was listening to a true classic of American literature. 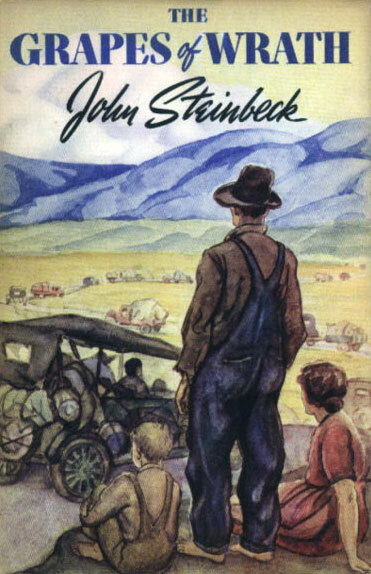 The Grapes of Wrath describes the harsh situation of people travelling in search of work and new opportunities during the Great Depression in the 30s. The story is presented from Tom Joad's perspective. He leaves prison on parole and travels to join his family in Oklahoma. Soon he joins in their journey to California, where they expect to start with a clean slate. Steinback's descriptions are succinct but powerful nonetheless. He paints a bleak picture where hope is often replaced with hopelessness. The author openly criticizes greed and thoughtlessness of those who caused the economic crisis. His description of Joads' journey is powerful and makes it easy to identify with those affected by the Depression. Klimat wyszedł spod Twojego pędzla niesamowity. Postacie wręcz ociekają grozą. Wyśmienita praca!